This image and the clay pigs at the bottom of this page were both copied from slides taken during an art lesson 30 years ago. 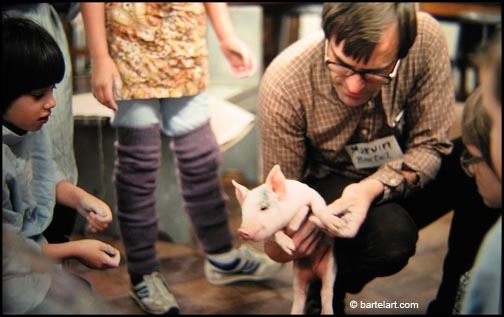 Here I was showing baby pigs to some children who then used the visual experience to learn how to make clay pigs (shown below). If you have a digital camera that focuses close up (macro), it can create good digital images from old 35mm slides. Using a digital camera to make digital images slides may be faster than a scanner. Set camera on a tripod (small tabletop tripod or a stack of books is okay). Set the camera to super macro focus. Some cameras focus closer than others. Test it by focusing on a postage stamp or similar small image. My lens is about a half inch from the subject when using it for 1:1 copying. Rig up a way to hold the slide in front of the lens. I use a cloths pin with one part taped and glued to a vertical stick stuck in a wood block base. You could also fashion a stand from a wire cloths hanger with a some kind of clip taped to it with duct tape. 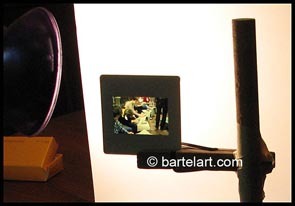 I place the emulsion side of the slide toward the camera to get the most accurate focus and reproduction. This is generally the brand name side of the 2 x 2 slide frame. This produces a mirror image that I flip in Photoshop. You retain the normal orientation and get nearly as sharp by focusing on the smooth surface. Using an automatic or programmed exposure should get the correct exposure, but you can experiment with over and under exposing. Setting the camera on a smaller ISO number produces better quality. I frame the slides so that the final cropping is done on the computer, but you may wish to crop with the camera. Directing one or two halogen desk lights at a white card produces reflected backlighting for the 2 x 2 inch 35 mm transparency. A clothespin here is used as a clip to support the slide. Place the camera (not shown) close to the slide to copy it. 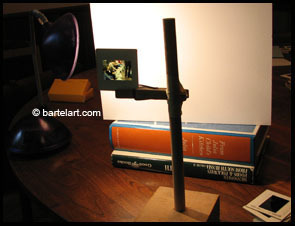 Provide a uniform light source to back-light the slide. I set up a white card about 8 or 12 inches behind the slide and illuminate the card with a bright halogen reading light. It takes a larger white card than I first thought to avoid showing the edges. Two lights makes it easier to get the light uniform. The white card reflects enough light to back-light the slide. Avoid light on the camera lens as that will decrease quality. This image was copied from a 35mm slide. 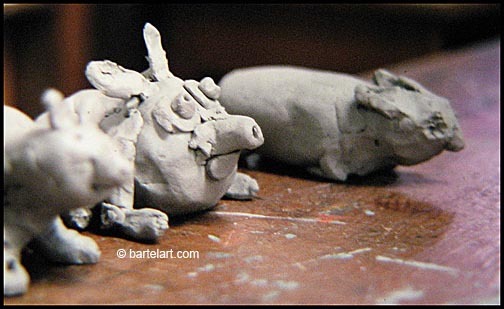 These clay pigs were made by children by cupping two pinch pots over a wadded newspaper core. They used wooden paddles to help join the clay cups over the wad of paper and to refine the forms. A small vent hole in the bottom is needed for firing. Heads can be made by adding another pinch pot. Paper may be left inside. The head also needs a small hole, or a hole is made between the head and the body. For fun, what if you ask the children what they think would happen of they place a small ball of clay in the paper that is in the animal. Do not tell them what will happen. Encourage experimentation and curiosity. After firing, see if they discover what happened to the paper. See if they discover that the animal rattles. All rights reserved. This page including the photographs are © Marvin Bartel, Emeritus Professor of Art, Goshen College. Teachers many make a single copy for their personal use so long as the copyright notice is included. Scholarly quotations are permitted with proper attribution.